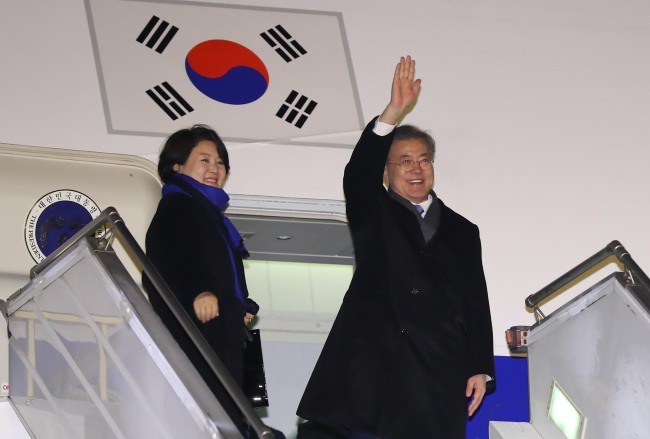 PRAGUE -- South Korean President Moon Jae-in headed to Argentina, ending his two-day unofficial visit to the Czech Republic, en route to the Group of 20 summit in the South American country. The president was set to arrive in Buenos Aires early Thursday (Argentine time). In Prague he held a summit with Czech Prime Minister Andrej Babis and agreed to expand economic and trade cooperation. Seoul and Prague established diplomatic relations in 1990 and upgraded their ties to a strategic partnership in 2015. Moon and Babis called for efforts to expand cooperation in new industrial sectors, such as artificial intelligence and information and communication technology. Moon also held a meeting with South Korean residents in the European nation. In Buenos Aires, Moon will take part in the G-20 summit where he will be joined by the leaders of 19 other developed and emerging countries for discussions on ways to ensure "fair and sustainable development." The annual summit will be held over two days from Friday. It will also provide a venue for a series of bilateral summits for Moon, according to his office Cheong Wa Dae. Moon is scheduled to hold a summit with U.S. President Donald Trump, which will mark the second Moon-Trump summit since September when the South Korean president traveled to the North Korean capital, Pyongyang, for his third inter-Korean summit with leader Kim Jong-un. Trump and Kim met in Singapore in June. They have agreed to hold a second summit, which is widely expected to be held early next year. The president will also hold meetings with the leaders of South Africa, the Netherlands and Argentina. The South Korea-Argentina summit will mark the first of its kind in 14 years.